1.High quality charging Chip TP4056, simple circuit, good protective value, high charging precision. 2.Complete mechanical automation processing, High reliability. 3.Automaticlly adjust the output current from 100 to 1000ma by simply changing the fixed resistor on the circuit board. It can be used to charge for one pcs of lithium battery or serval parallel lithium batteries. Power Indicator: Red stands for charging, Green stands for fullly charged. 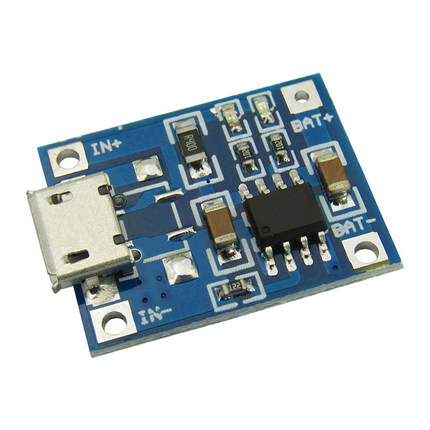 1.The Ampere meter can only be connected to 5v input port of the module. 2.It is better that the charging current is 37% of the battery capacity. For example, the charging current should be 400 for the 1000mAH battery. 3.The connection wire should not be too thick. 4.Make sure the connect point is good.